American writer and philosopher whose career began as a freelance newspaper writer in Chicago (1872-76). By the early 1890s he had written three novels. In 1895 he founded his Roycroft Shop in East Aurora, New York, where he revived old handicrafts, especially artistic printing and produced The Philistine, a monthly magazine. He had 500 various workers there by 1910, including metalsmiths, leathersmiths, bookbinders, and funiture craftmen. Collectors still value Roycraft furniture. 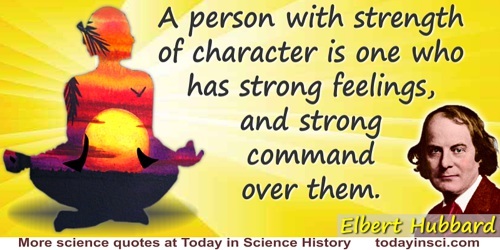 A person with strength of character is one who has strong feelings, and strong command over them. Aphorism in The Philistine (Jan 1905), 20, No. 2, 60. A pessimist: an optimist out of a job. Aphorism in The Philistine (Dec 1904), 20, No. 1, 10. All the world’s a stage, but the parts are often badly cast. Aphorism in The Philistine (Jan 1905), 20, No. 2, 33. 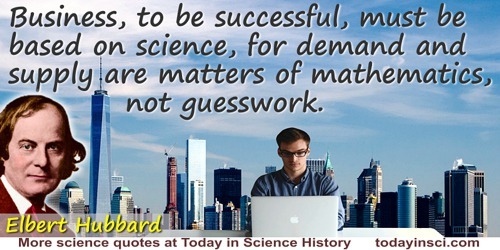 Selected writings of Elbert Hubbard (1928), 101.
Business, to be successful, must be based on science, for demand and supply are matters of mathematics, not guesswork. The Book of Business (1913), 56. Discontent is inertia on a strike. Aphorism in The Philistine (May 1905), 20, No. 6, 183. Dogmatism has only one eye, but bigotry is stone blind. Aphorism in The Philistine (Mar 1905), 20, No. 4, 128. Envy is an eyesore engendered by looking at another’s success thru the spectacles of our own inferiority. Aphorism in The Philistine (Apr 1905), 20, No. 5, 160. Every man has his little weakness. It often takes the form of a desire to get something for nothing. For the average mind precedent sanctifies. Good luck is science not yet classified; just as the supernatural is the natural not yet understood. 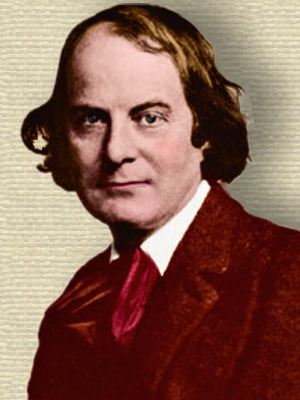 In Elbert Hubbard (ed. and publ. ), The Philistine (Dec 1907), 26, No. 1, 10. He who criticises, be he ever so honest, must suggest a practical remedy or he soon descends from the height of a critic to the level of a common scold. I do not believe that God ever created a man and then got so “put out” over the job that He damned him. I would rather have a big burden and a strong back, than a weak back and a caddy to carry life’s luggage. Aphorism in The Philistine (Dec 1904), 20, No. 1, 26. If [a man] is sent to a hospital, he is supplied with a topic of conversation, and often is boastful. In 'Nature's Supreme Desire', Cosmopolitan Magazine (Oct 1912), 53, No. 5, 579. In the Life of Darwin by his son, there is related an incident of how the great naturalist once studied long as to just what a certain spore was. Finally he said, “It is this, for if it isn’t, then what is it?” And all during his life he was never able to forget that he had been guilty of this unscientific attitude, for science is founded on certitude, not assumption. In Elbert Hubbard (ed. and publ. ), The Philistine (May 1908), 26, No. 6, 172. It is always the nearest, plainest and simplest principles that learned men comprehend last. In Elbert Hubbard (ed. and publ. ), The Philistine (Mar 1908), 26, No. 4, cover. It is the patient workers, and the active, kindly sympathetic men and women who hold the balance of things secure. Let it be understood that the University is a preparatory school: it is life that gives you the “finals”—not college. Aphorism in The Philistine (Dec 1904), 20, No. 1, 30. Life is death on a vacation. Aphorism in The Philistine (Mar 1905), 20, No. 4, 158. Nature is the great ocean of intelligence in which we are bathed. No one ever enjoys any more freedom than he has strength to take and use. In A Thousand and One Epigrams (1911), 151. Science is simply the classification of the common knowledge of the common people. It is bringing together the things we all know and putting them together so we can use them. This is creation and finds its analogy in Nature, where the elements are combined in certain ways to give us fruits or flowers or grain. In Elbert Hubbard (ed. and publ. ), The Philistine (Dec 1907), 26, 10. Success is voltage under control—keeping one hand on the transformer of your Kosmic Kilowatts. In Little Journeys to the Homes of Great Reformers (1909), 68. The best men are always first discovered by their enemies: it is the adversary who turns on the searchlight, and the proof of excellence lies in being able to stand the gleam. Aphorism in The Philistine (Dec 1904), 20, No. 1, 18. 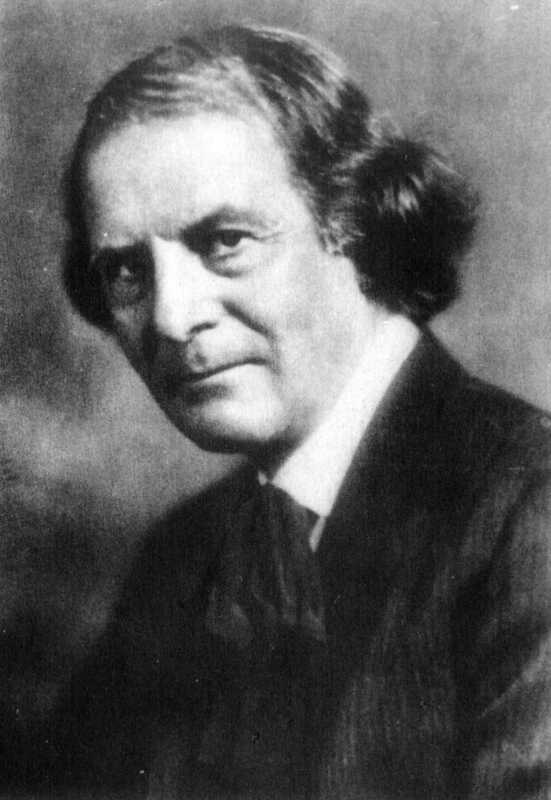 Elbert Hubbard and H. P. Taber, Philistine: A Periodical of Protest (Nov 1908), 27, No. 6, 184. The expression Similia similibus is a Latin phrase and means that an imaginary disease can best be cured by an imaginary remedy. In Elbert Hubbard (ed. and publ. ), The Philistine (Mar 1908), 26, No. 4, 105. The reference is to the phrase “similia similibus curantur” (similar things take care of similar things; or, like cures like). The men you see waiting in the lobbies of doctors’ offices are, in a vast majority of cases, suffering through poisoning caused by an excess of food. In Love, Life and Work (), 129. The nation that prepares for war will sooner or later have war. We get just anything we prepare for, and we get nothing else. Everything that happens is a sequence: this happened today because you did that yesterday. Used as epigraph on cover of Harry Persons Taber and Elbert Hubbard, The Philistine: A Periodical of Protest (Apr 1902), Vol. 14, 128. The probable fact is that we are descended not only from monkeys but from monks. Used as epigraph on cover of Harry Persons Taber and Elbert Hubbard, The Philistine: A Periodical of Protest (Aug 1909), Vol. 14, 128. Philistine: A Periodical of Protest (Sep 1902), 15, No. 4, 92. The worst thing about medicine is that one kind makes another necessary. Two-thirds of all preachers, doctors and lawyers are hanging on to the coat tails of progress, shouting, whoa! while a good many of the rest are busy strewing banana peels along the line of march. In Elbert Hubbard (ed. and publ. ), The Philistine (May 1908), 26, No. 6, 151. Vivisection is blood-lust, screened behind the sacred name of science. In Elbert Hubbard (ed. and publ. ), The Philistine (1907), 26, 187.